“I do worry about the president&apos;s saber rattling, his hints that US military intervention remains an option. I want to make clear to our witnesses and to anyone else watching: US military intervention is not an option,” Engel said. 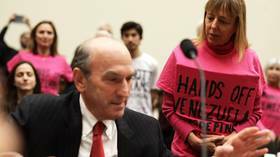 At Venezuela hearing, Dem Rep. Sherman argues that coup regime shouldn&apos;t have to pay Russia back for money it loaned to Venezuela. There&apos;s no commitment to any principle, including capitalism. Everything is subsumed to prerogatives of Empire. Makes Abrams seem reasonable. Published on Wed, 13 Feb 2019 22:31:00 GMT, © All rights reserved by the publisher.